Even though I was just eight years old at the time, I can still remember the sadness I felt when I learned that the Yankees had traded the “Moose” to the Dodgers after the 1962 season. He was one of my favorite Yankees. I can also remember opening a pack of baseball cards the next spring and seeing Moose’s first non-Yankee card. As shown here, he’s pictured hatless, still wearing the pinstripes with the words “Los Angeles Dodgers, first base” printed below his name. It remains one of my least favorite cards. Reflecting on that trade three and a half decades later, giving up Moose was the first step the Yankees took in the dismantling of that great Yankee team of the late fifties and early sixties. Perhaps not coincidentally, Moose’s last season in the Bronx was the last time the Yankees won a World Championship until fourteen full seasons later. As far as Bill “Moose” Skowron was concerned, what you saw was not always what you got. Take his face for example, he looked like one of those ornery, tough-talking, short-fused Marine drill sergeants. In reality, Moose was one of the kindest, most gentle Yankees to ever play the game. Moose had a finely sculpted, muscular body. But rips, pulls, and spasms to those muscles caused Moose to spend much of his career in terrible crippling pain. Skowron was also one of the most helpful and encouraging members of the Yankee team. It was Moose who would show up at the Stadium hours early to help a teammate drill and practice his way out of a hitting or fielding slump. Another Yankee player could strike out four times in a row and still get a pat on the back and some kind words from Moose. But as nice as Moose was to everyone else he was impossibly critical and tough on himself. He could be three for three, drive in five runs and still smash a water cooler and scream obscenities at himself because he hit a ball off the end of his bat the fourth time up. Skowron was born in Chicago on December 18, 1930. He was a star schoolboy athlete and received the nickname “Moose” from a grandfather who, for some reason, was reminded of the Italian dictator, Benito Mussolini when he looked at his grandson. Skowron was a two-sport athlete at Purdue University where he was signed to a Yankee contract right off campus. Skowron became an immediate hit as a Yankee when he batted .340 in 87 games during his 1954 debut season with the parent club. Moose topped the .300 mark the next three years, also. Even though he batted right-handed, Moose had a powerful opposite field swing, perfectly suited to Yankee Stadium. His Yankee career numbers saw Moose hit 25 homeruns and drive in 100 for every 162 games he played. In the early stages of his Yankee career, crafty and merciless Yankee GM George Weiss, exploited Moose by paying him thousands of dollars less than Skowron’s achievements on the field deserved. Finally, his Yankee team mates grew tired of seeing Skowron taken advantage of and lectured the timid and shy first baseman on the art of salary negotiation. A much better-informed Moose was then able to get Weiss to fork over more equitable amounts. In the late fifties, a series of disabling back injuries cheated Skowron of playing time and prevented him from putting up even more impressive numbers during his Yankee career. The pain at times grew so bad, Moose could not get off a chair without assistance or even tie his own shoes. But by 1960 and 1961, Moose was healthy enough to enjoy two of his finest years as a Yankee. Together with Mantle, Maris, Berra, Howard, Richardson, Kubek, and Boyer, Skowron was part of one of the most productive offensive and defensive starting line-ups in the history of the game. Moose was a solid World Series performer, in seven fall classics as a Bomber. He batted .283, smacked 7 round trippers and drove in 26 runs in a total of 35 Series games. 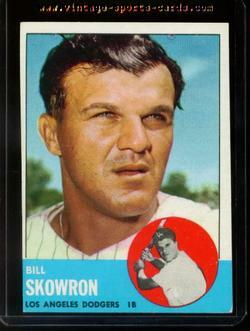 Skowron’s eighth and final Series performance was in a Dodger uniform against his beloved former teammates in 1963. Moose was a hitting star for Los Angeles, batting .385 in a four game sweep of New York. Back when Moose was a rookie, as much as he craved playing time, the fact that he was getting it at the expense veteran first-sacker, Joe Collins, was upsetting to the kind-hearted Skowron. It was not until Collins himself approached Moose and actually started helping the rookie take over his position, that Skowron’s sympathy for Collins began to subside. Eight years later, a brash, loud-mouthed Joe Pepitone showed little respect for the man he was trying to replace, constantly telling Moose his days as the Yankee regular first baseman were numbered. Skowron, ever the pro, remembering how Collins helped him as a rookie, now offered the same assistance to the outspoken Pepitone. Compounding the fact that Moose was being pushed out of his position by this talented rookie, Skowron’s marriage began to disintegrate. When the Yankees traded Moose to the Dodgers for starting pitcher, Stan Williams, Pepitone was able to replace Moose’s offensive numbers and defensive skills, but not the positive and giving attitude Skowron exhibited toward his Yankee teammates. Moose passed away on April 27, 2012 at the age of 81. He shares his December 18th birthday with this former Yankee pitcher and this former Yankee super scout. Well, that’s a heckuva nice tribute. I think Moose would fit in up there carved in granite on Mount Rushmore with his stout chin and great integrity. RIP Mister Skowron.